Poor Robert Langdon. He seems to always get himself into trouble – finding out about the true history of Jesus Christ and his potential bloodline, getting involved in some Illuminati shenanigans in Rome, plus some other exploits that haven’t quite made it to film yet. This time, it’s drama based on the idea of Dante’s inferno, the 14th century poem exploring a man’s journey through Hell. Unlike The Da Vinci Code (2006) and Angels and Demons (2009), I hadn’t read Dan Brown’s book on which this film is based before actually seeing the film. I wonder if it would have made any difference as to my actual enjoyment of the film, or my level of care about the plot. As it stands, Inferno is a fairly mediocre film, but it’s not 100% terrible. Tom Hanks, as the one and only Robert Langdon, seems quite bored with playing Langdon and presents as a mere shell of someone who used to be vaguely interesting. Hanks is partnered by Felicity Jones, as Dr Sienna Brooks, who is really batting below her average, given some of the better films she’s starred in recently. Ron Howard’s edgy, jerky directorial style is more annoying that engaging or tension-building, but he does make good use of Langdon’s disturbing PTSD-esque dreams and intrusive memories as interesting story cues; with accompanying cool imagery of the undead walking through Florence, rivers of blood, your classic plague masks, et cetera. All the fun things you expect to see on an Italian holiday. What Inferno seems to be missing in terms of its story, however, was a more thorough exploration of its underpinnings in art and history, which makes it stand out like a sore thumb in comparison to its two predecessors. As a result, Inferno loses its spark somewhat. Rather than a blaze, it’s more of a minor grass fire, with a fairly lazy ending. Like some of the other not-so-great films I’ve written about, there’s usually at least one good thing in the film to provide some balance. 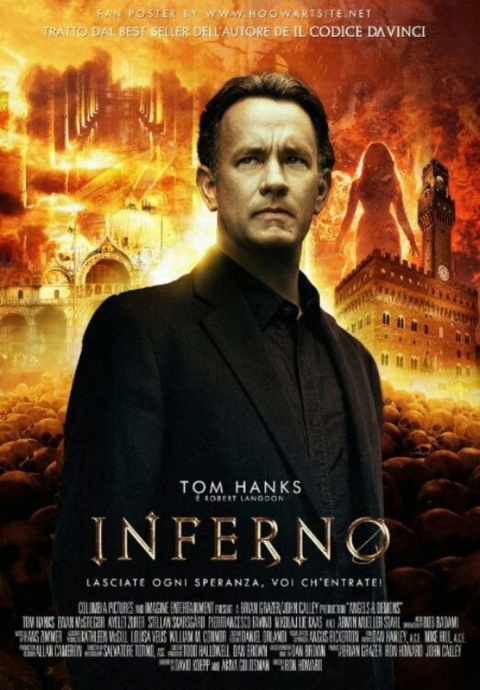 In Inferno, one huge positive is director Ron Howard’s use of environments despite the aforementioned jerky visuals – we get to see some gorgeous sights of Florence, and certain moments set in the famous Duomo are thrilling and exciting, mostly due to the action taking place in areas where tourists aren’t allowed to go. It must be noted that half the reason why I secretly enjoy watching mediocre films like this is to enjoy the environments, architecture, and art of cities that I haven’t visited yet. Florence is certainly on the list, and at that basic visual level, the film was enjoyable. I know this review sounds quite cynical, because it is. Secretly, as cheesy as these silly films and books are, I can’t help but get swept up in the mysteries of the art and history that they explore, and Inferno made me want more of that. All of these films have a classic, sick Dan Brown twist, and Inferno has a fun one – albeit with a lazy ending that makes you wonder if the book is any better. The story and performances are just too weak for this to be a must-see. If you’re wanting to reminisce on a previous holiday to Florence (or Istanbul), you might enjoy it. But ultimately, this is another mediocre Dan Brown adaptation from book to film. If it’s on television and you’re vacuuming the house at the same time, it might serve as some nice background noise. No thanks covers it for sure haha. Sure does! I wonder if they’ll ever make another one, or if this is the last we’ll see of Robert Langdon on film.